Prestigious LocWorld scientific conference with the participation of eCorrector! Today eCORRECTOR participated in LocWorld37, Warsaw. LocWorld is a leading conference associating enthusiasts of international business, translations, global management and localization sector. The participants were those who are responsible for communication that transcends language and culture in the global market. With a special emphasis on global business, the conference provides an opportunity to exchange high-quality information on the language and translation services as well as the technology market. 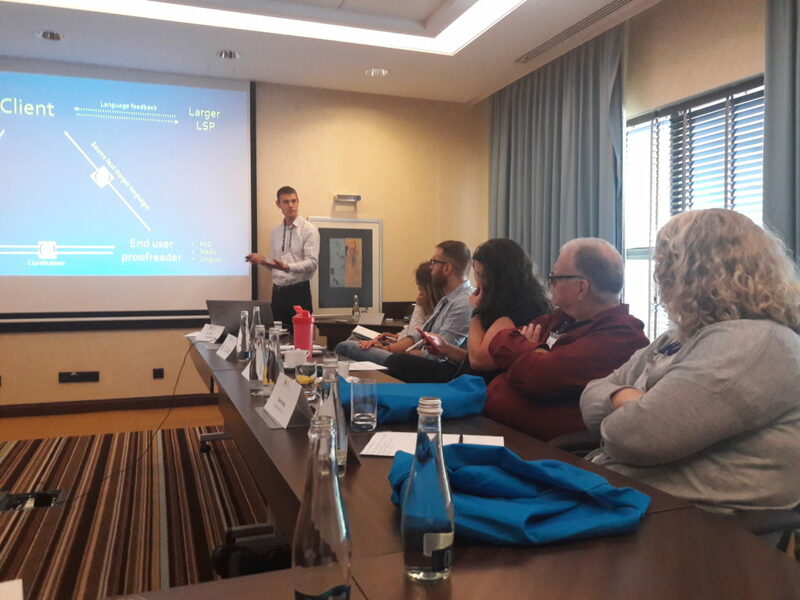 Our scientific editor, Mark Hunt, gave a presentation on some of eCORRECTOR’s business processes at the Life Sciences Business Round Table. In the world of translation and location, the life sciences industry is different from other industries due to the unique and specific nature of its requirements. This field of science combines issues in the fields of biochemistry, biology, microbiology and many other related disciplines. With the ever-changing market, the highest importance is attached to the quality of services. At the discussion forum, experts, including clients and entrepreneurs, will present and share their thoughts and experiences regarding specific processes, as well as discuss market requirements and challenges in the industry. The topic that Mark spoke about was scientific proofreading and issues in the field of the location sector. The role of the quality assurance process is becoming more and more important. Mark in his speech drew attention to a very pressing issue: in the world of science, texts must be thoroughly checked – often scientific articles are created and translated by an author who is not a professional linguist. During this session on linguistic quality control, the problem was discussed from a slightly different perspective: in a world where medicine and medical devices dominate, what is usually highlighted as editing, correction and review in individual countries can sometimes be combined in a single step through commitment of experts or proofreaders. The event also featured representatives of such companies as Facebook, LinkedIn, Globalese, Lingo24 and Google – the very cream of the industry. It was a very rare opportunity to be among the representatives of such large platforms gathered in one place, and LocWorld provided us with it. During the event there were also lectures on the utility of medical devices or the essence of correct translations in the company’s functioning. This Friday, we warmly invite you to SmartCat Partner Day in Warsaw, during which our founders, Mark Hunt and Dorota Sakowska, as well as our colleague Magdalena Ochmańska, presentation how SmartCat can improve the functionality job processing. We can’t wait! Will you be with us? We hope so! This is an opportunity you can’t miss!